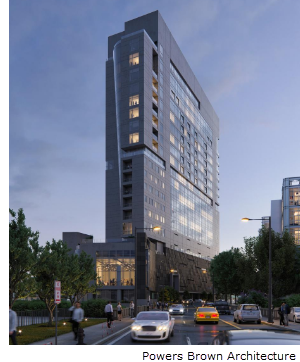 ​​​ SAN ANTONIO – The Arts Residences at the Thompson San Antonio hotel has pre-sold 60 percent of its condominiums, developer DC Partners announced. DC Partners called the project the fastest selling luxury condominium project in Texas. The 20-floor, 337,000-sf project plans to feature 162 hotel rooms, 58 condos, and five penthouse suites. The $116 million development is scheduled to be completed by first quarter 2020. Residents can expect an array of on-site amenities, including a restaurant, a 5,000-sf pool deck with cabanas and bar, spa, fitness center, and 24-hour room service and concierge service. ​Check​ out Retail and Multifamily​ Market Research.